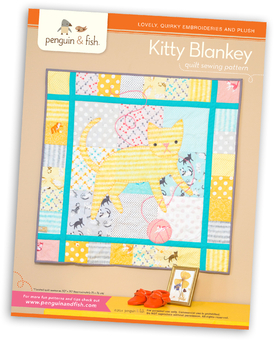 This Kitty Blankey quilt sewing pattern looks great with our Here Kitty Kitty fabric line! Finished quilt size: 30"x 30" (Approximately 76cm x 76 cm). Includes instructions for the entire quilt making process from cutting to binding, a glossary of terms and a full-sized appliqué template.